What we need to remember about the 9yo Gold Coast girls who jumped on a car. 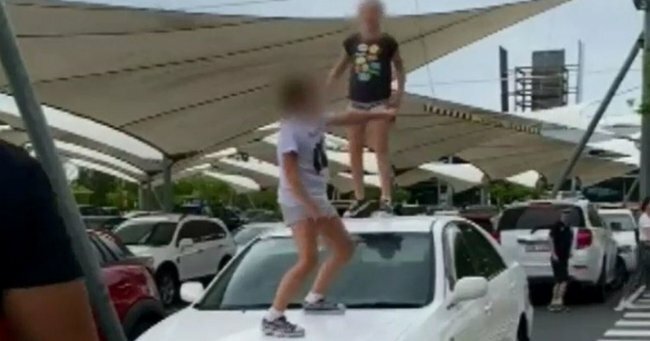 Do you know the story behind the 9yo girls jumping on a car at a Gold Coast shopping centre? Australian media outlets are today circulating a video, which on first glance is troubling. Two nine-year-old girls can be seen in the footage jumping on the roof and windscreen of a car in a Westfield carpark on the Gold Coast. Moments earlier, they’d verbally attacked an elderly woman inside the centre, punched a security guard, and continued to scream at shoppers from the top of the car. “This is our car so get f***ed. Get f***ed, you ****,” one of the girls yells. One of the girls spits on a guard. They also start throwing out homophobic slurs at members of the public walking by. “We know the law, you can’t touch us,” one yells. This all went on for about 90 minutes. Eventually the police bundled the girls into the back of a patrol car, to take them home. Here’s a clip from the video as played on 9News. Post continues after video. Of course, it’s chillingly easy to watch a few minutes of a video, and draw overarching conclusions. To see children behaving badly, and make judgements about who they are, as well as the ‘quality’ of the parenting they’ve received. But do any of us know the full story behind how these girls ended up in a shopping centre carpark, angry and aggressive? How two nine-year-olds learn the language and behaviour that’s now been shown on news programs around the country? On social media, a small number of comments from a minority have started to emerge. According to several reports, when the girls were put in the patrol car, they were “taken home to their foster parents”. Those with firsthand experience of the foster care system seemed to view the footage through a different lens, expressing their pain at caring for children whose behaviour might be similar to that of these two little girls. “We can’t touch them, all we can do is ask them to stop. It’s a vicious and heartbreaking cycle to have to watch and be a part of,” one woman wrote. “These kids are a product of the system they have been victim to,” wrote another. We don’t know the full story. We don’t know anything about these girls, and we don’t know anything about their parents or carers. But what possible purpose can public shaming serve? What can two nine-year-old girls possibly gain from having their behaviour ridiculed and mocked by the Australian public? And surely, they are better served with empathy rather than judgement.